Should You Try Exercise to Lower Cholesterol Naturally? Home » Heart Health » Cholesterol » Should You Try Exercise to Lower Cholesterol Naturally? Exercise to lower cholesterol fits nicely into the daily routine of anyone looking to improve their health and lower the risk of heart disease. High cholesterol is a major contributor to coronary artery disease, heart attack, and stroke. Nearly half of all Americans over the age of 20 have dangerously high cholesterol levels. Thankfully, for most, high cholesterol can be controlled naturally with dietary adjustments, weight management, and increases in physical activity. That said, exercise does not have a direct impact on “bad” low-density lipoprotein (LDL). Instead, it can help increase the amount of “good” high-density lipoprotein (HDL) that can help shuttle LDL deposits from the arteries to your liver, where can they can be converted to bile for digestion or expelled from the body. High cholesterol in America is largely a result of the SAD (standard American diet) and sedentary lifestyle. The SAD is rich in saturated fats and refined sugars that can boost LDL and total triglycerides while easily increasing fat mass. A sedentary lifestyle further contributes to increased fat mass because nothing is happening to all the extra calories being taken in—they are simply not being utilized as energy. This lifestyle also encourages poor circulation, allowing LDL deposits to form more easily along arterial walls. Changes to diet and activity levels are the best natural ways to lower cholesterol, reduce weight, and improve blood flow. How Does Exercise Lower Cholesterol? How Does Yoga Help to Lower Blood Cholesterol? Exercise can help lower cholesterol, but it’s not the primary area you should focus on. Excess cholesterol in the body comes from dietary measures, so the first place to start is by cutting back on fatty foods, processed foods, and items rich in refined sugar or high-fructose corn syrup. That said, using exercise to lower cholesterol naturally does have its place. Because studies have shown that exercise can increase HDL, which typically decreases your risk for cardiovascular disease, it increases the potential for arterial cholesterol deposits to be removed. HDL can act like a street cleaner for your arteries. Exercise—particularly resistance exercise (weight training)—can improve protein synthesis, which also might lower the likelihood of LDL deposits accumulating. The benefits of exercise on LDL are indirect—it doesn’t lower LDL; rather, it boosts HDL that can help remove dense LDL deposits. Most experts agree that no one specific exercise routine, movement, or mode is best for lowering cholesterol. Instead, increasing your activity, making better food choices, and maintaining a healthy weight for your body type works synergistically for the best results. For example, you could exercise every single day and still put on weight, increase fat mass, or see little change in cholesterol level if you’re making poor dietary choices. Exercise is an important component of a healthy lifestyle and is a major player in lowering the risk of cardiovascular disease and heart attack. Using exercise to lower cholesterol will be most effective if you’re doing it frequently—between 30 and 60 minutes almost daily—having fun, being safe, and eating a healthy diet. The kind of exercise or activity you’re doing isn’t as important, as long as you’re breaking a sweat and putting in some effort. Boosting your non-exercise daily activity (simply spending more time upright and walking) is also a great way to get more bang for your buck. A 2002 study from Duke University found that exercise can improve the particles that carry cholesterol through the body. It makes the cholesterol larger and “fluffier,” floating through the bloodstream with no harmful effect. The dangerous form of LDL cholesterol is made of dense pieces that accumulate along arterial walls. A 2013 study analyzing the effects of exercise intensity on heart disease risk factors revealed that walkers and runners who burned the same amount of energy during workouts saw a similar lower risk of high cholesterol and high blood pressure. Walking is also easier than running on the joints, which is a common concern among older adults. You may want to consider biking to work or to the corner store for an errand run. A group of Swedish researchers found that older men and women who bicycled to work had a lower chance of developing high cholesterol than other commuters. In a study published in the Metabolism journal, sedentary women between ages 50 and 70 were assigned to either swimming or walking programs three times a week for 12 months. Compared to walking, swimming resulted in lower total and LDL cholesterol levels in participants. Scientists studying women aged 70 to 87 years who practiced resistance training for 11 weeks reported much lower total and LDL cholesterol levels than the control group. Dancing and jogging or running have also been found to have cholesterol-lowering effects. When it comes to natural ways to lower cholesterol, it really doesn’t matter what kind of exercise you do. Lifting weights can help increase metabolism by adding more muscle to your body, while aerobic exercise like cycling can help burn calories and enhance blood flow. I personally would avoid jogging or running. These are probably the most inefficient forms of exercise because they can lead to joint damage and pain, and do not do anything for your body that less risky modes of exercise can’t. Alternating between aerobic (swimming, walking, cycling, dancing) and strength building (weight training) exercises for about 150 minutes each week is a great way to help manage weight and cholesterol, combined with a healthy diet. If your goal is to use exercise as a way of lowering or controlling cholesterol, here are some key components to keep in mind. Include more lean proteins, fruit, vegetables, whole grains, and healthy fats in your diet. Limit processed and refined foods. Talk to your doctor before beginning any exercise regime. Avoid working out to the point of excessive chest pain, shortness of breath, dizziness or light headedness. When doing aerobic exercise, train with an intensity that allows you to break a sweat but doesn’t leave you gasping for air. You should still be able to maintain a conversation. If you’ve never exercised before, work with a certified fitness professional. This is especially true for resistance training or any other exercise modality. Don’t CrossFit if you’re not an experienced lifter. Start with light-moderate intensity. You may only be able to do 10 minutes at first each day, and there is no point in pushing it. Progress naturally and your body will soon become capable of higher intensities and greater frequency. Get a comfortable pair of sneakers and wear loose-fitting, comfortable clothes. Increase general non-exercise daily activity. This could include parking farther away from the entrance to buildings, taking the stairs, walking to run errands, or simply reminding yourself to get up and move around for five to 15 minutes per hour. Find a modality that you enjoy—and there can be many. You don’t have to stick to one kind, but give yourself enough time to decide how you truly feel about an activity (usually three to four weeks). Remember to stay hydrated. Bring a water bottle with you when exercising and try to stick to a water intake of about eight ounces per 20 minutes of exercise. This will vary between individuals and depends on how much sweating you do, the temperature of your exercise environment, and other factors. Stay on track if you miss a workout or have bad day of eating; get back on the horse with your next meal or the next day. There is some information on yoga being an effective treatment for high cholesterol. But I would be very cautious about adopting it as your only form of exercise-based cholesterol control. There are a number of health benefits offered by yoga, but reducing cholesterol is not likely to top the list. A study published in the Indian Heart Journal did find that one hour of yoga daily for a three-month period lowered the total cholesterol, triglyceride, and LDL levels and boosted the HDL counts of a group of type 2 diabetics. However, researchers noted that yoga should be used as part of an integrated approach to diabetes treatment. Yoga is a great complement to an exercise routine, and can provide some major benefits for overall health in terms of stress relief, mobility, and reduced inflammation. But doing yoga is highly unlikely to lower cholesterol in otherwise inactive people with poor diets. Any benefits to cholesterol that might be a byproduct of yoga would be perhaps related to improved circulation, lower inflammation, and better stress management. Yoga, however, has not been conclusively proven to improve protein synthesis, lead to weight loss, or create the same internal climate as aerobic or anaerobic exercise. It is beneficial to a healthy lifestyle, surely, and is recommended, just not as a steadfast way to lower cholesterol. If you decide to include yoga as part of a preventative lifestyle against cardiovascular disease, make sure that it’s in addition to a healthy diet and exercise routine. You should also consult with your doctor first if you’ve been diagnosed with high cholesterol. Pregnant women should not practice the kapalbhati pranayam technique in particular. If yoga is all you’re doing, you likely won’t get the results you’re expecting. It’s also advised to avoid doing hot yoga or any other unconventional high-intensity yoga classes, and stick to the basics. Work with an experienced instructor, too. So, does exercise lower cholesterol? Research shows that exercise and cholesterol are related, but again, the biggest factor in making a dent in triglycerides is being more conscious with food choices. Make sure your exercise efforts are being complemented by a diet high in fruits, vegetables, lean proteins, and healthy fats to enhance the effects of exercise to lower cholesterol naturally. Green, J., “High Cholesterol and Exercise: Helping Your Clients Lower Their Numbers,” NCHPAD, https://www.nchpad.org/874/4979/High~Cholesterol~and~Exercise~~Helping~Your~Clients~Lower~Their~Numbers, last accessed January 16, 2018. Wang, Y. & Xu, D., “Effects of aerobic exercise on lipids and lipoproteins,” Lipids in Health and Disease, 2017; 16: 132; DOI: https://doi.org/10.1186/s12944-017-0515-5; https://lipidworld.biomedcentral.com/articles/10.1186/s12944-017-0515-5, last accessed January 16, 2018. “Cholesterol Management Guide,” WebMD, 2017; https://www.webmd.boots.com/cholesterol-management/guide/exercise-to-lower-cholesterol, last accessed January 16, 2018. 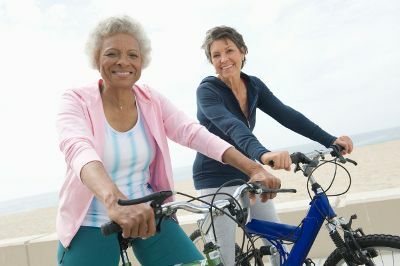 Story, C., “Lowering Your High Cholesterol: 6 Exercises That Will Pay Off,” Healthline, Medically reviewed by on Deborah Weatherspoon on April 17, 2017; https://www.healthline.com/health/high-cholesterol/treating-with-statins/best-exercises#1, last accessed January 16, 2018. Williams, P., “Relationship of Distance Run per Week to Coronary Heart Disease Risk Factors in 8283 Male Runners The National Runners’ Health Study,” Archives of Internal Medicine, Jan. 1997; 157(2): 191–198; http://pubmedcentralcanada.ca/pmcc/articles/PMC3756592/, last accessed January 16, 2018. Williams, P. and Thompson, P., “Walking Versus Running for Hypertension, Cholesterol, and Diabetes Mellitus Risk Reduction,” Arteriosclerosis, Thrombosis, and Vascular Biology, May 2013; 33(5): 1085–1091; http://atvb.ahajournals.org/content/early/2013/04/04/ATVBAHA.112.300878, last accessed January 16, 2018. Grontved, A., et al., “Bicycling to Work and Primordial Prevention of Cardiovascular Risk: A Cohort Study Among Swedish Men and Women,” Journal of the American Heart Association, Nov. 2016; 5(11): e004413; http://jaha.ahajournals.org/content/5/11/e004413, last accessed January 16, 2018. Cox, K., et al., “A comparison of the effects of swimming and walking on body weight, fat distribution, lipids, glucose, and insulin in older women—the Sedentary Women Exercise Adherence Trial 2,” Metabolism, Nov. 2010; 59(11):1562-73; http://www.metabolismjournal.com/article/S0026-0495(10)00054-5/abstract, last accessed January 16, 2018. Fahlman, M., et al, “Effects of Endurance Training and Resistance Training on Plasma Lipoprotein Profiles in Elderly Women,” Journal of Gerontology, Feb. 2002; 57(2):B54-60; https://www.utoledo.edu/med/depts/medicine/endocrinology/pdfs/Effectsf_of_endurance_training.pdf, last accessed January 16, 2018. “Cholesterol Guide: Exercise Tips,” Cleveland Clinic; https://my.clevelandclinic.org/health/diseases/12111-cholesterol-guide-exercise-tips, last accessed January 16, 2018. Shantakumari, N., et al., “Effects of a yoga intervention on lipid profiles of diabetes patients with dyslipidemia,” Indian Heart Journal, Mar. 2013; 65(2): 127–131; https://www.ncbi.nlm.nih.gov/pmc/articles/PMC3861018/, last accessed January 16, 2018. “Reduce cholesterol naturally with yoga,” The Art of Living; https://www.artofliving.org/in-en/yoga/health-and-wellness/yoga-for-cholesterol, last accessed January 16, 2018.